Ricardian Equivalence is a theoretical concept that has been used to argue that fiscal policy is not effective. The argument is that increased government spending implies higher future taxes, so households will increase savings to cancel out the increase in government spending. This concept has been heavily disputed; see this blog entry by Bill Mitchell for an example. He argues that various assumptions are too restrictive in the models that show the “Ricardian Equivalence” effect. 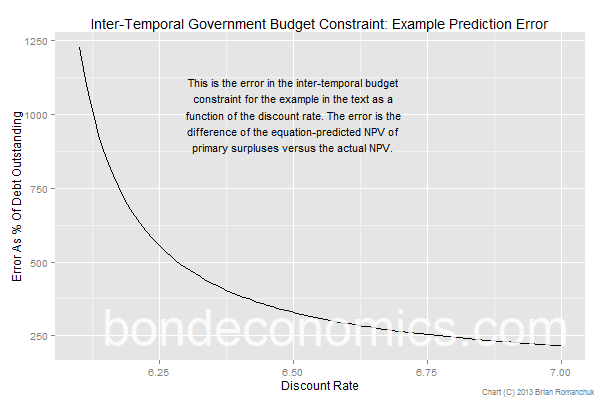 In this article, I will introduce the “inter-temporal governmental budget constraint”, which is the equation which provides the justification for Ricardian Equivalence. I also show why this equation does not hold if term premia are non-zero. The chart above gives an example that shows the error in its prediction about the Net Present Value of future primary surpluses can become arbitrarily large. This has obvious implications for models that incorporate this constraint, as well as the usage of the concept in the analysis of fiscal sustainability. (1) Amount of government debt outstanding = Net present value of all future primary surpluses. Note: The primary surplus is the fiscal balance excluding interest payments (see this post for more details). As an example of a usage of this incomplete version of the equation, it was used in the Wikipedia entry for “Fiscal Sustainability” (at the time of writing). To be fair, the equation is noted in passing, without details on embedded assumptions. Equation (1) is often loosely interpreted as meaning that the stock of debt outstanding must be “paid off” by future primary surpluses. This interpretation then leads to a common loose definition of Ricardian Equivalence – if you increase the amount of debt, future taxes will arise to pay back that debt. This incorrect interpretation would appear to be refuted by the fact that governments roll debt, and so “the debt is never paid back”. However, the equation does not imply that government debt must be reduced to zero; it is equivalent to assuming that the Net Present Value (NPV) of the debt goes to zero as time goes to infinity. In other words, the stock of debt can grow exponentially over time, however the growth rate is less than the discount rate. The missing term in equation (1) is the effect of seigneurage; which is typically interpreted as the profit the government earns from creating (“printing”) non-interest bearing money or reserves. (2) Amount Of Government Debt Outstanding = NPV(future primary surpluses + seigneurage “revenue”). The addition of seigneurage is obviously necessary. Debt can be cancelled with “printed money” without the need for a primary surplus. However, even if the increase in the amount of money is not permanent, the equation needs to be modified. As an example, assume a rather small government has $100 in debt outstanding, and the 1-year interest rate is 5%. Let us then assume the government buys back the debt with $100 in the form of money. After one year, it runs a primary surplus of $100, which then cancels out the increase in the monetary base. (Since the debt was bought back, the primary surplus equals the overall fiscal surplus.) The NPV of the sequence of primary surpluses was $100/(1.05) = $95.24. This is less than the initial stock of debt ($100). Money printing is associated with inflation, as a result of the quantity theory of money. That is beyond the scope of this article. However, the key point to note: seignorage has to be accounted for as it creates a liability with an interest rate less than is assumed in the discount curve used to derive the governmental inter-temporal budget constraint. Equation (2) will not hold in the real world. The reason why is hinted in the previous section: interest costs for the government should be expected to be below the path of forward rates generated by the government curve used to discount the NPV of surpluses. At year 1, the debt matures and the new outstanding is $105. This debt is rolled into a new 1-year debt issue, and the expected rate is also 5%. At year 2, the second debt issue matures, and the outstanding is now $110.25. A primary surplus of $110.25 is used to repay the debt completely. More generally, equation (2) will only hold if the term premium is exactly equal to zero for all maturities. However, there is a very large academic literature - affine term structure models – which is predicated precisely on the fact that term premia are non-zero. In fact, the profitability of borrowing short and lending long (which exploits the term premium), is an empirical regularity that has been known about for centuries. (From the point of view of a bond investor, rolling bonds is expected to generate higher returns than rolling T-Bills over long time horizons.) Meanwhile, governments typically have a large amount of short-dated paper that is repeatedly rolled over. This creates a very large amount of debt that will be rolled at rates below the forwards implied by the discount curve. The country has $100 in 1-year debt (annual pay) outstanding. The interest rate on 1-year debt is 5%, and will always be rolled at 5%. Nominal GDP growth is 6%. A primary deficit is run each year, in order to keep the debt/GDP ratio constant. In year 1, the government has to pay $5 in interest, taking the debt outstanding to $105. However, the debt outstanding has to rise to $106 so that the debt outstanding grows at the same pace as nominal GDP (6%). Therefore, a $1 primary deficit is run. In year 2, the government has $5.30 in interest expenses (5% of $106). However, it needs to increase its debt by $6.36 (6% growth rate), so that the primary deficit has to be $1.06. It can be easily verified that the primary deficit will grow at 6% per year thereafter. The budget constraint equation (2) insists that the NPV of the primary surpluses for all future time would be $100. Instead, increasingly large deficits are run each year. The chart at the beginning of the post shows the magnitude of the error in the “equation”, as a function of the discount rate. assume some epsilon-small amount of debt is outstanding at each maturity beyond the 1-year point. This creates the discount curve needed. In this case, the forecast errors of the NPV will be slightly smaller than is shown in the chart. Since the error is unbounded as the discount rate tends to 6%, this is non-material. In any event, some similar extrapolation would have to be done in the real world, as most governments have maximum bond maturities around 30-50 years. Finally, one could argue that the errors are truly unknown, since we cannot observe the term premium or long-term growth rates. This may be true, but that just implies that the errors in the inter-temporal government budget constraint are unknown but can be arbitrarily large. This makes it entirely useless as an analytical tool. redefining how to calculate the “net present value”. Even so, the constraint will still fail as the result of weaknesses in the assumptions regarding the behaviour at infinity. Moreover, even if all of these not very sensible assumptions are imposed on the model in order for the constraint to hold, a welfare state will behave in the opposite manner than is commonly supposed by the usual interpretation of Ricardian Equivalence (hint). I will discuss these points in one or more follow-up posts.